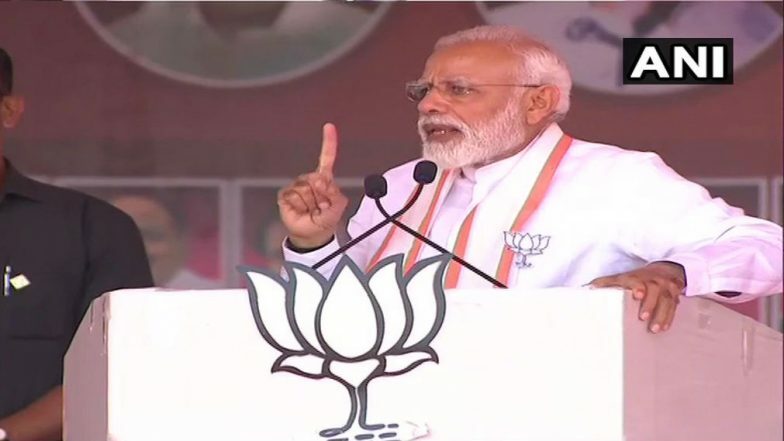 Theni(TN), April 13: Prime Minister Narendra Modi launched a broadside against the Opposition Saturday, saying the DMK, Congress and their 'mahamilavati' friends cannot accept strides India has made and therefore were "unhappy" with him. Taking a swipe at the DMK-Congress combine, he said those who were "sworn enemies" have joined hands, despite the national party having "humiliated" its southern ally in the past. Arun Jaitley Hits Out at Opposition For Running 'Rent A Cause' Campaign, Questions Rahul Gandhi's Educational Qualification. "Today India is rapidly making a mark in the world. The Congress, DMK and their mahamilavati friends cannot accept this. That is why they are unhappy with me," he said at an election rally here. The Prime Minister has been describing the opposition 'mahagatbandhan' (mega alliance) as 'mahamilavati,' meaning adulterated. Taking pot shots at DMK President MK Stalin's proposal naming Congress chief Rahul Gandhi as Prime Ministerial candidate, Modi said there were no takers for this among the opposition "because they are in line to be PM and dream of the post." "Some days ago, DMK supremo (Stalin) projected the Naamdar (dynast--Gandhi) as PM (candidate) but no one was ready to accept it, not even their mahamilavati friends, because they are in line to be PM and dream of the post," he said, without naming anyone. PM Narendra Modi Attacks HD Kumaraswamy, Asks 'Whether Will He Retire From Politics If BJP Forms Govt at Centre in 2019! '.